Hernandez, who won the first Olympic men's boxing medal since the 2008 Beijing Olympics by taking bronze at the Summer Olympics in Rio de Janeiro, Brazil, was 94-5 as an amateur. 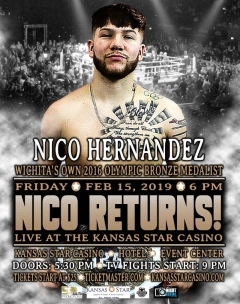 He also captured six national titles, scored eight wins in the Ringside World Championship (an annual Kansas City-area event billed as "the largest amateur boxing tournament in the world"), along with six consecutive Silver Gloves National Championship wins, and a 2014 National Golden Gloves gold medal. On fight night, the doors open at 5:30 pm (CST) and the action starts at 6:00 pm. Bouts subject to change. The Kansas Star Casino is located at 777 Kansas Star Drive in Mulvane, Kansas. For more information visit www.sho.com/sports follow on Twitter @ShowtimeBoxing, @SHOSports, #ShoBox, or become a fan on Facebook at www.Facebook.com/SHOSports.